There is a “real prospect” of “major disruption” at UK ports in the case of a no-deal Brexit, according to MPs. The Public Accounts Committee (PAC) said government preparations for avoiding disruption around major ports were “worryingly under-developed”. Committee members also said there was a “real risk” the Department for Transport (DfT) would not be ready for a hard Brexit. The DfT said the committee’s conclusions were not “accurate”. In a statement it said it was “both disappointed and surprised” that the PAC had “failed to reflect” the evidence in the National Audit Office’s report “which found that the department has made a determined effort in its preparations and achieved a great deal”. The UK is set to leave the EU on 29 March 2019. The PAC is responsible for scrutinising the value for money of public spending, and holding the government to account for the delivery of public services. It has published a series of reports looking at different government departments’ preparations for Brexit. As with these previous reports, it was “concerned about how well government is prepared”. Committee chairwoman Meg Hillier said: “The future of road, rail, maritime and air access to Europe after Brexit remains unclear and the Department for Transport has a critical role in ensuring the UK is prepared. 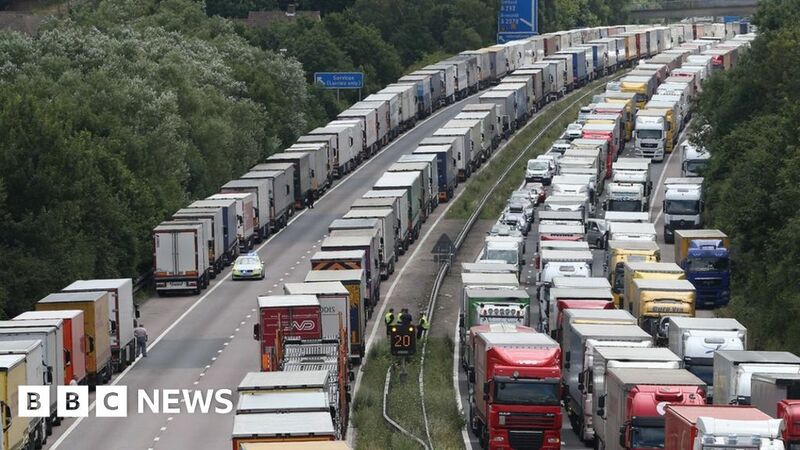 The DfT intends to introduce “Project Brock”, to deal with lorry queues on roads to Dover for cross-Channel journeys. The plan involves holding coast-bound lorries on the M20 so traffic not heading for the port can carry on moving. Much of the criticism in this report from MPs is centred on the notion that the Department for Transport (DfT)’s preparations for a “no deal” scenario have been too secretive. They argue that it makes it harder for the wider business community to plan. We have known for some time now that the government has been using non-disclosure agreements when it has been discussing no-deal plans with transport companies. Some details have leaked out. For example, I’ve been told that officials have been asking ferry companies about their capacity to carry vital supplies in the event of EU customs checks causing disruption at the border. The DfT says preparations need to be kept secret to avoid them damaging the commercial interests of the firms involved. And details of Operation Brock, the department’s £35m plan to keep traffic flowing freely on the M20 near Dover, have been published, as well as other preparatory schemes, like the one to ensure that holiday-makers travelling to the EU can access international driving permits. However, the Public Accounts Committee feels it hasn’t been able to properly scrutinise many aspects of the department’s no-deal planning and it argues that has contributed to its perception, outlined in this report, that the DfT is being “complacent” and that there is a risk that our transport systems and infrastructure won’t be sufficiently prepared for “no deal” come 29 March. Ms Hillier said the DfT planned to spend £30-£35m on Project Brock, but had not yet carried out proposed “desk-based” testing. Engagement with businesses had been “poor”, she added. The PAC recommended that the DfT should write to it before Christmas “setting out the results of any testing of Project Brock, and how wider plans to keep ports across the UK open for business have progressed”. The Road Haulage Association’s chief executive Richard Burnett said the report had confirmed what many members had told the body. “Information has been patchy, often unhelpful, confusing and generally too little, too late,” he said. The PAC said it acknowledged the “difficult situation” for the DfT in having to prepared for all Brexit scenarios. However, it felt the department must be “open about the challenges it faces and work with business and stakeholders to help them get ready for what the future brings”.